The first dish that came up was the Tom Kha Chicken (S$14.50++), which looked really spicy and appetising. We ordered the soup with coconut milk because it gives this rich and creamy texture, which makes the soup more flavourful. True to what it looks, the soup was tangy and bursting with flavours—filled with lots of ingredients like chicken, tomato and mushrooms that makes the whole dish complete. Next came a refreshing dish that helped wash down the spiciness of the tom yum soup. We are not really fans of salad but this Papaya Salad With Salted Egg (S$10.50++) definitely won us over. The papaya salad was zesty, spicy and refreshing—combined with the peanuts and salted egg gives this crunchy and flavourful experience. Up next was their Massaman Curry With Chicken (S$16.50++) was topped with peanuts and also sweet potato, which surprisingly complimented the whole dish. Masaman doesn’t pack as much heat as other curries, so if you are into something less spicy, this is the dish for you. Marinated with cinnamon and star anise, the shredded chicken was tender and flavoursome, and the taste of the whole dish was really sweet and satisfying. Saving the best for the last, one of the best pork necks we had was served on our table. 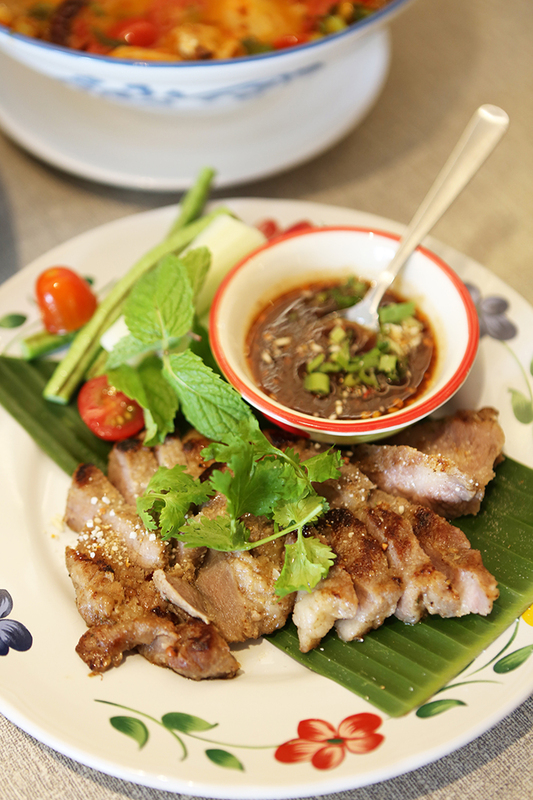 We love their Grilled Pork Neck (S$12.90++) because the fat to meat ratio was 1:1, making it the golden ratio which allows you to taste the tenderness and juiciness of the meat. Dipped in the special sauce that was spicy and savoury, we devoured the dish within minutes. As this restaurant is located in the CBD area, prices of the food might be a little bit pricey but fret not, for those who are looking for a more wallet-friendly option, they also have set lunches that comes with complimentary tom yum soup on weekdays at only S$15++. Hi, the restaurant is located along South Bridge Road, not beach road. Thanks!